Traffic and road situations are constantly changing; therefore your safest position on the road constantly changes accordingly. Low-risk riders actively manage their road position and aim to be in the right place all the time. 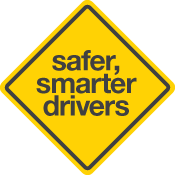 Choose to ride where you can best maintain visibility to other vehicle operators. Motorcycle riders have very little to protect them in a crash. 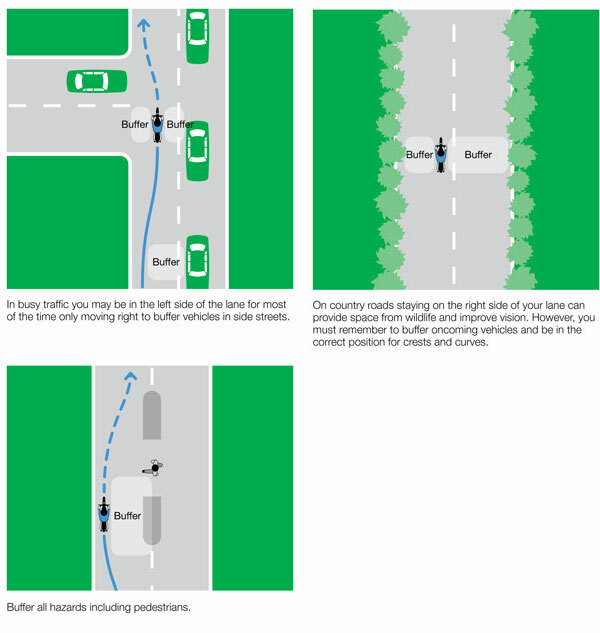 The more space you can create around you and the greater your distance from other vehicles and pedestrians the better. This is referred to as ‘buffering’. 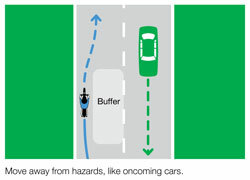 Buffering not only moves you away from potential hazards but also increases the likelihood of you being seen by other road users. A relatively small change in road position can result in a significant change in the quality of road surface. Variations in road surface can seriously affect a motorcycle’s balance and stability, brake effectiveness and the distances needed to slow and stop. Motorcycle riders need to watch for poor surfaces, including paint, oil, water, sand, gravel, pot holes and metal plates, and be ready to adjust their riding. Sometimes it’s not possible to avoid riding on a poor surface. 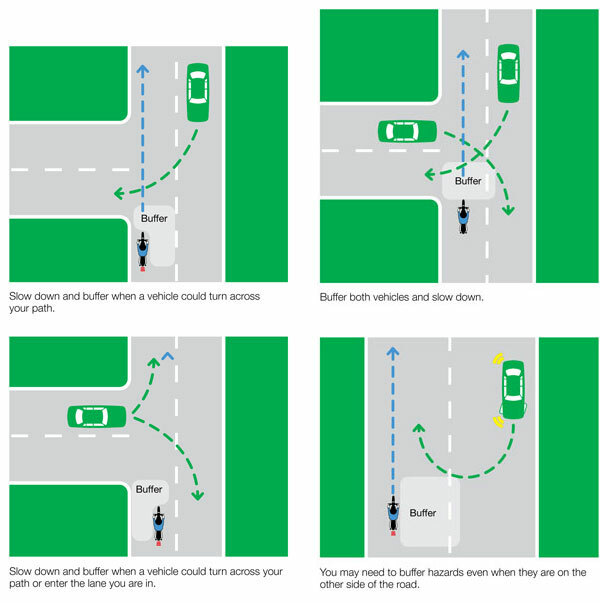 For example, you may want to be in the left side of your lane to allow a safe buffer from an oncoming vehicle, but the left side of the road may be bumpy and broken up. 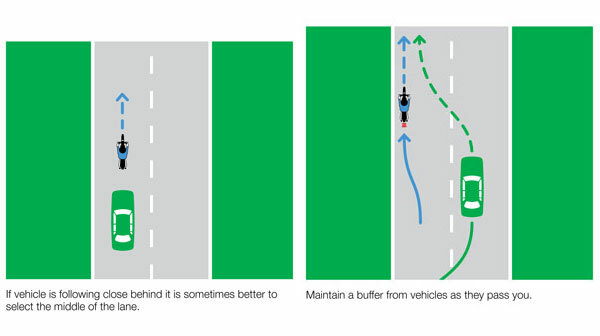 If you need to ride on a poor surface to buffer yourself from a hazard, just slow down. A good road position allows you to see further and get more information about what is happening up ahead. 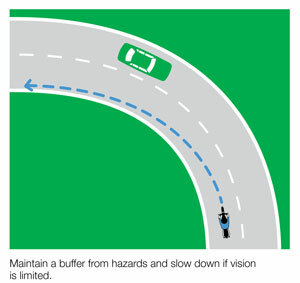 Generally the right side of the lane provides good vision up the road, to the sides and behind you. However, it becomes a dangerous road position when there is oncoming traffic. 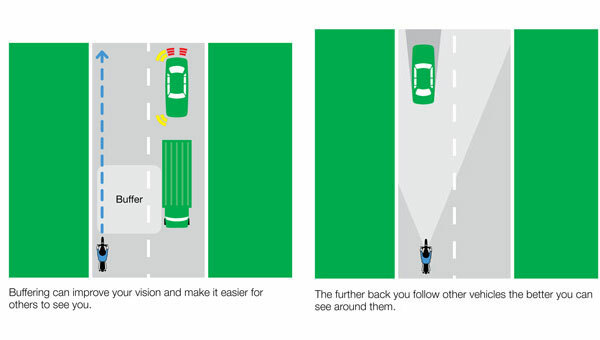 Choose a road position that provides good vision without compromising your buffer from hazards, particularly when following large vehicles or taking left bends. Avoid the oil trail left on roads by other vehicles as it can reduce your traction, particularly in wet weather. 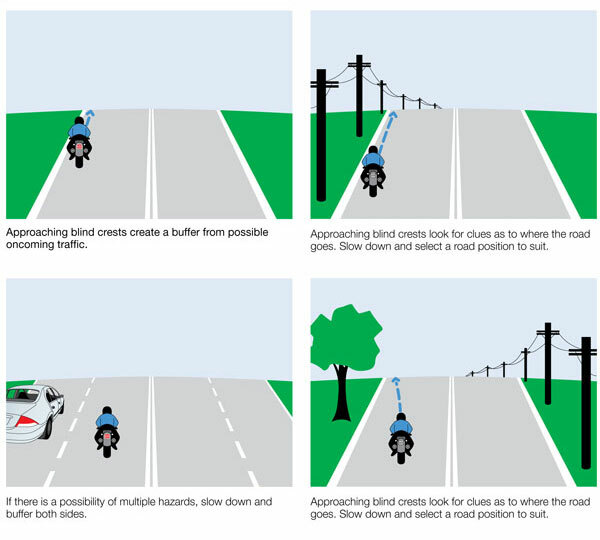 Motorcycle riders can legally use any part of their lane.